Weighty Matters: A real world mom on the futility of the parental, "No". A real world mom on the futility of the parental, "No". Today's guest post is from Kristen Schlag, who among many other things, is a caring and concerned Virginian mom. A few weeks ago I invited her to guest post here on the blog after she emailed me to tell me of her frustration when her autistic son came home sporting that sticker up above. Here's her take on the utility of the, "parental no", as well as a clear cut example of why regardless of the dollars they put in, Big Food has no place in our schools. It was a typical crazy day. I had spent three hours downtown waiting for car repairs to be done (that’s not easy with a three-year-old). I knew I needed to go to the grocery store and if I didn’t do it before the older kids got home from school it probably was not going to happen. To make a long story short: the car didn’t get done at all, my husband had to pick us up and the kids got home from school right after we did. Gabriel is in second grade and he’s autistic. The first thought that ran through my mind: the school is using my seven-year-old autistic son as an unpaid corporate sponsor. 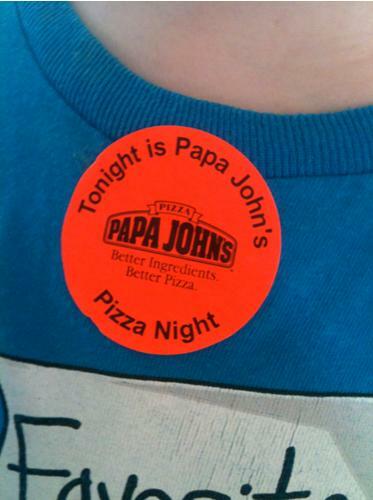 I asked Gabriel what the sticker was for, he told me we are supposed to order pizza tonight from Papa John’s for “Spirit Night”. I explained to him that, while pizza is very tasty, it isn’t very healthy for our bodies and Mommy and Daddy will decide what we have for dinner. Autistic children thrive on routine and take expectations very seriously. It is hard for him to learn that he can’t have his favorite food when another adult gave him the expectation. Predictably enough, he was very upset. 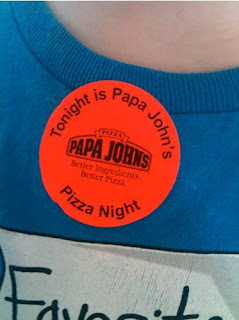 When I went through his and his sister’s school folders later I found a flyer in both advertising the Papa John’s fundraiser, a letter from the PTA stressing how important these fast food fundraisers are and the school calendar for October with a reminder about a Chick-Fil-A “Spirit Night” on the 18th. I try to feed my kids good food, I really do. It’s not enough that the school gives them things like chicken nuggets and macaroni and cheese for lunch every day. They offer some fruits and veggies too, but if you were a kid what would you fill up on first? The school offers them the choice of chocolate milk every day as well. The food companies like to say if my kids become overweight it’s my fault; parents just need to learn how to say no. I say no constantly! Everyday! We don’t watch commercial television; we rent videos instead because of the constant barrage of ads. We explain to our children what is and isn’t healthy and why; we offer fruits and veggies at meals and snacks. We aren’t perfect, but we shouldn’t have to be. These fast-food outlets are using the fact that schools are underfunded to prey on children. It’s not fair that helping raise money for our school also contributes to making kids sick. Don’t get me wrong; I love pizza. I think my kids should have pizza sometimes and I probably give it to them more than I should, but nobody should be telling my children to ask me to buy them unhealthy foods, and nobody should be putting a sticker on my son at school advertising their salty, fat-laden foods.